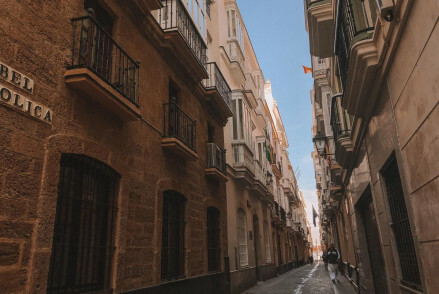 Now in its fourth millennia, Cádiz is thought to be the oldest continuously inhabited settlement in Europe and it's an excellent choice for people who appreciate their sun and sand seeped in history. The old heart of town is almost completely surrounded by water now as the Atlantic crashes gustily at the crumbling sea wall. But there's plenty of energy in the locals, who're known for their ironic Carnival, where the songs parodise and ridicule politicians, celebrities and even the church. The also sing cheerful flamenco songs. Our Guru’s recommendations for the best places to stay in Cádiz offer beach access but something else besides. If your idea of the best places to stay in Cádiz have a maximum budget attached then we think you’ll be pleasantly surprised by what’s on offer. Cádiz really does have everything. The beaches are relatively small but there are much larger stretches just along the coastline. The old town is a wonderful jumble of streets and alleys ripe for exploring and treasure hunting. There are monuments a plenty and an enticing food culture involving a lot of seafood and outdoor dining. Cádiz has the wonderful fortifications of a Spanish colonial city, and the eroding sea walls - built after Sir Francis Drake’s sacking in 1596 - create a romantic atmosphere of gradual change that often inspires us to seize the moment. Cádiz is fairly easy to get around. It’s not large, but if you do want to get out of the old town and explore the new town and its larger beaches then there’s an easy to use bus service. Some of the highlights are the old cathedral with the wonderful North Tower and the Roman theatre just behind it, the Archaeological Museum, the grand Oratorio de San Felipe Neri, which is where the first Spanish Constitution was signed and the Torre Tavira, which is a tower by the market with a ‘camera obscura’ and incredible views. Visit the 18th century Castle of San Sebastián situated at the end of a long stone causeway jutting out into the sea. Spend a day basking under the sun on the picteresque Playa La Caleta. Catch a performance at the landmark Gran Teatro Falla, a19th-century concert hall. Stop by the impressive Cádiz Cathedral and scale the cathedral’s Poniente Tower for panoramic city views. Wander through the bustling Mercado Central (market) for a glimpse of daily life. Don't forget that this is an incredibly popular destination. So if you want to be sure of a room in one of the best places to stay in Cadiz, get organised and book well ahead. The Hotel Argantonio is perfect for history buffs. The decor feels more Havana than Andalucia but that's part of the pleasure. With Moroccan hand-carved arches and terracotta colours each room reflects a different part of the city's impressive history. You’re also close to the beach, while still being in the heart of town. Fly to the small Jerez de la Frontera airport, just half an hour from the city. Sevilla and Malaga are larger airports well served internationally and located 2 and 3 hours respectively from Cádiz. Best time to visit - Cádiz is a year round destination with 300 days of sunshine a year. Summer temperatures peak at 29°C with August being the warmest month and winters remain pleasant with average temperatures of 14°C. 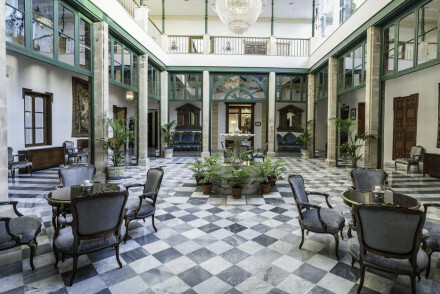 A charming and simple Cadiz hotel in an old building down a historic winding street. Interiors are smart and clean with a friendly communal living room, and the simple rooms are bright and cosy. Ideal for families and groups, and great value too! 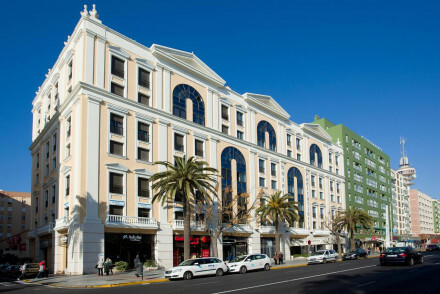 A contemporary hotel in an impressive building, with modern stone-and-marble interiors, and an enviable beach-side location. Spacious rooms have a sleek and clean aesthetic with pale wooden floors, soft hues and indulgent bathrooms. A modern, base ideal well positioned near to Cádiz Old Town. 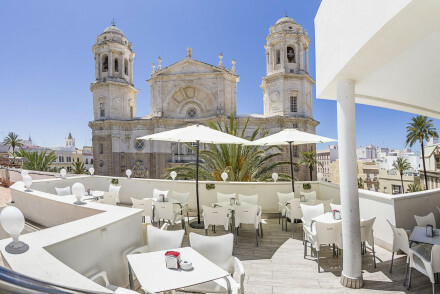 A perfectly positioned hotel set just opposite the iconic Cadiz Cathedral. Smart rooms are chic and contemporary. The buzzing roof terrace features a restaurant in one section and a refreshing pool in another. While the lively downstairs bar spills out onto the plaza, giving an authentic edge. Sensitively renovated 17th century hotel in the heart of the old town. Expect a warm welcome and a lovely homemade breakfast spread each morning. Interiors are sophisticated yet in keeping with the antiquated aesthetic, with authentic tiling, Persian rugs and hardwood furniture. A real gem! Renovated and tranquil hotel in Mozarabic style, full of character. 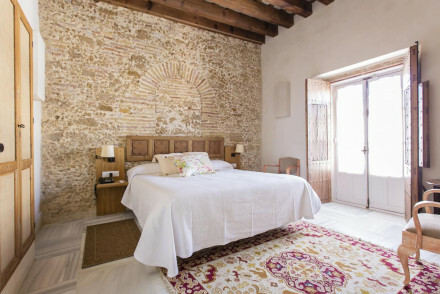 Andaluz, rustic or colonial styled rooms with terracotta hues, Moroccan-style hand-carved arches and wooden beams. Fantastic traditional buffet style breakfasts. Close to the beach and ideal for local exploring. City Style - A charming hotel in the heart of the city, featuring an uniquely eclectic and interesting decor style rich in history. Great walks - A great way to see Cádiz are the theatrical guided tours, full of fun and information. Sailing - If you have a week to spare there are fantastic sailing courses in the local harbour. Fishing - For all those angelers, the hotel will happily arrange deep sea fishing trips. 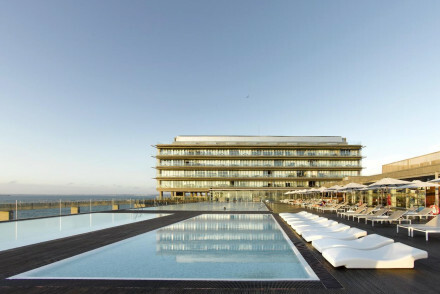 A modern hotel on Cadiz' sealine with a swish glass-and-marble design in the reception areas and a dreamy outdoor pool with loungers. Smart, chic rooms are bright and spacious, with large windows and terraces. The well-equipped gym and spa are a plus, as is the top-quality restaurant. A beautiful old hotel set in a botanical garden with a dreamy pool. The gorgeous interiors are embellished with old tapestries and paintings and feature potted palms, tiles and elegant furniture. Grand rooms have fine bedsteads and hardwood furniture. A romantic base to suit classical tastes.